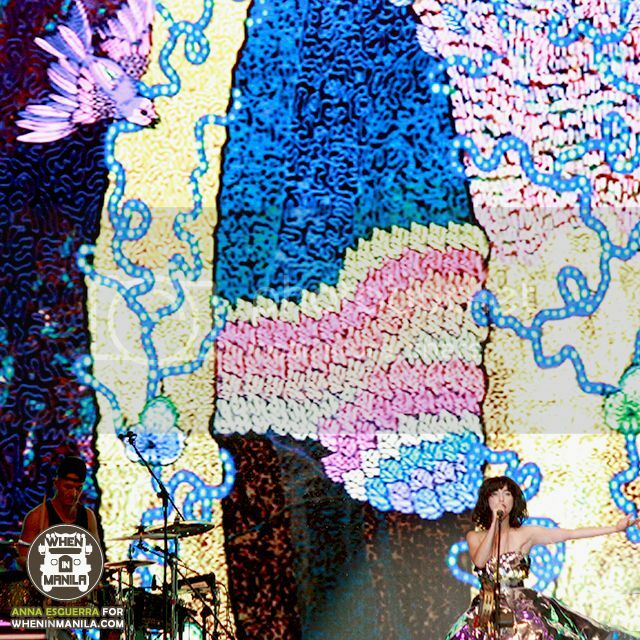 I had the privilege of watching the lovely Kimbra Lee Johnson perform live at the MADFest (Music + Art + Dance) 2014 by Jack TV last December 5. This was also the first time she visited the country; and from the photos that surfaced during the time, it looked like she had a great time. She and her entourage visited a couple of places and did loads of fun stuff. Touristy by my standards, but still looked fun. Happy that she was entertained throughout her stay here. A band had just finished their set when my friend and I got inside the MOA concert grounds. I had little time to go around the entire venue to check out the art installations and fun things set up for guests.. only got to enter an hour before Kimbra’s set. Yes, shame on me for coming in late and missing the rest of the amazing performers. Urbandub was the band that I got to see before our headliner. They are great performers as always! Though the songs they performed, save for a few like the famous “First of Summer”, weren’t familiar to me anymore.. must be new songs. So many musicians that night, but the total number of bands/artists I’ve seen that night were only two. I should know better than to go late at events like this! 😛 Skimming over blog posts about this event, there were at least 3 other local bands that I would’ve loved to watch (again) if only I arrived hours earlier. Since the show started around 4-5PM.. people have been waiting and standing all night waiting for her. When the clock struck at midnight… there was a countdown and at the moment we hit the big “one”, she finally came out the stage. Apparently, Kimbra’s golden fleece is quite a famous wardrobe staple during her concerts. Don’t get me wrong, I am a fan of her music too.. I just haven’t been paying attention to what she wears in her shows. 😛 I found out about this fun fact later on. Right from the bat, Kimbra is a very energetic and lively performer. If I wasn’t busy shooting photos, I would’ve danced along with the entire crowd. No I wouldn’t but for someone who actually dances, you’ll be forced to. She’s that infectious w/ spreading good vibes in her show, promise! Hehe. Sometime during the first part of her set, I was having doubts and feeling a little sad because.. I put too much expectations on how I anticipated Kimbra sounds live. You see, this was the legit first video I have watched from Kimbra that made me REALLY love the music she puts out. Yes, after her stint w/ Gotye I haven’t seen her until that live rooftop video that I randomly found, might I add. I may have watched that video too many times for my own good. Yeah.. and the performance in front of me kind of pales in comparison with the type of music I got used to in that moment. HOWEVER, my worries were put to rest because when she performed Goldmine, it was GOOOOOOOD. I can rest now and be confident that the rest of the hour it’ll be an amazing time. 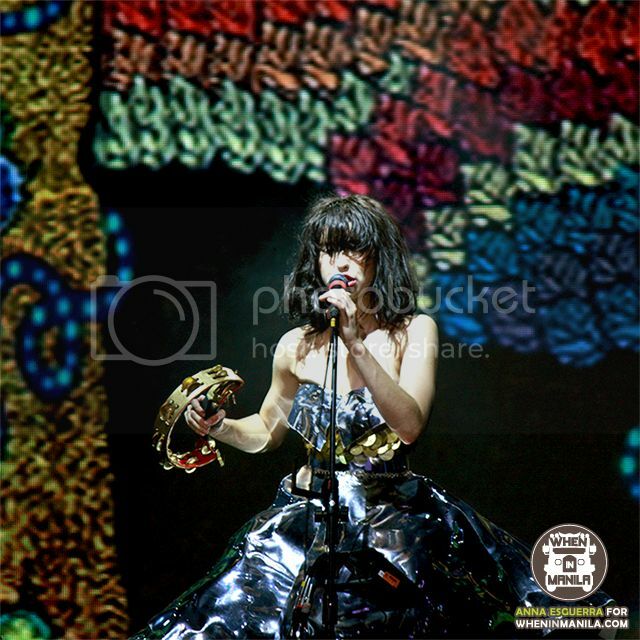 RELATED: 5 REASONS WHY KIMBRA ROCKED MADFEST2014 at When in Manila! I love the way she does her music. She pushes the limits as much as she can, IMO. Possibly one of the refreshing and good find of a musician I’ve discovered. Loved Vows from beginning to end. I had my doubts w/ The Golden Echo and thought it wouldn’t come close to how good Vows was. Good thing that this is nothing a few repeated listening can’t fix. Some songs I heard from the show that are part of TGE are still stuck in my mind, and to think it’s been weeks after that event! Kimbra dedicated her song Goldmine to the Filipino people that night. People were expecting heavy rain and typhoon that night, but we were so lucky that did not happen. Otherwise, that would have spoiled a great show. Inside I was giddy because this is one of my favorite songs in the new album and I get to hear it live. 😂 She said that the song is about finding confidence in oneself and being strong, amidst it all. …or something like that. Other songs that are my favorite that she also performed were Carolina, 90s Music (!!! Had no idea this was also the current single?? Lol), and Come Into My Head which was the last song. Other songs were from her Vows album. Madhouse I thought was an appropriate and witty song to be included in the setlist. The event is called MADFEST after all. I would say that this was a fairly short set, but it wasn’t entirely a Kimbra Live in Manila Concert kind of event… so I’ll take what I can get. 😛 Let’s consider this as a preview of what’s to come.. if she comes back next time. I certainly hope she does! Longer setlist would be great too. This has been a wonderful opportunity to shoot Kimbra and see her in person perform her songs live. Thank you, When in Manila! 😊 This is definitely the best show to end my 2014! As the saying goes, save the best for last. After the concert, I noticed that there were some people who weren’t familiar w/ who Kimbra is. That goes for both online and offline crowd. That’s okay, I said to myself, I don’t know who all the EDM DJs are anyway. Fair enough. 😛 But I am a little saddened about this.. I thought by now everyone would know who Kimbra is. I guess she’s still a little “indie” (I’m probably using the term in the wrong context right now) to some people. Gates were supposed to open at 4pm, but we actually got in around 5:30, and the first performer (Toni B.) started around 6pm. Rainy and I were in line by 3:30pm. The girl before us was there by 1pm, and was lucky enough to get a three-second convo with Kimbra herself, who didn’t enter the venue from backstage, but instead through the VIP gates. It is sad that most people only know Kimbra from that Gotye song, though. And she performed here and her songs barely even get airplay! Tsk. Nice review! Sounds like it was a fun experience after all.